Fortnite Season 7 is now just a few hours away, and to celebrate, Epic has released an adorable Christmas-themed trailer. 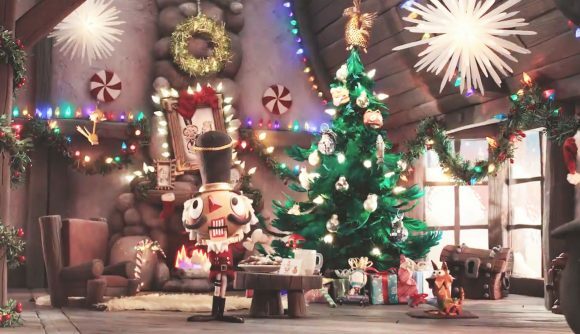 The video, which was posted to Twitter earlier this morning, features the Nutcracker-themed Crackshot skin in a Christmas film entitled ‘Santa’s on his Way’. The video opens to Crackshot – a legendary skin that was only available for a brief time at the beginning of this year – charging through the door of a quaint Christmas cabin. He quickly sets about making the dwelling as festive as possible, much to the delight of the stop-motion Bonesy sleeping by the hearth. There are tonnes of little details hidden throughout the video, from the golden llama sitting on top of the Christmas tree to the gingerbread men fashioned after the Merry Marauder skin. It doesn’t take very long, however, until things start going wrong, and Crackshot’s Christmas film is rudely interrupted.The trailer zooms out, showing off a bunch of Fortnite characters gathered around a telly in their Christmas jumpers, accompanied by some ominous rumbling. That rumbling turns out to be the result of the Fortnite iceberg, which will likely make landfall when the servers come up. Upon that iceberg is one of the new Fortnite Season 7 skins, accompanied by legions of evil-looking snowmen. The trailer also offers another look at Fortnite’s new X-4 Stormwing planes, which are heading to the battle royale alongside ziplines and the new Fortnite Creative mode, which lets you build custom game modes for you and your friends, all on your own private island. Check out the trailer in the tweet embedded above.